For other uses of King James Version, see King James Version (disambiguation). In the beginning God created the heavens and the earth. The earth was without form, and void; and darkness was on the face of the deep. And the Spirit of God was hovering over the face of the waters. Then God said, "Let there be light"; and there was light. The New King James Version (NKJV) is a translation of the Bible published by HarperCollins (a subsidiary of News Corp). The New Testament was published in 1979, the Psalms in 1980, and the full Bible in 1982. It took a total of 7 years to complete. The anglicized edition was originally known as the Revised Authorized Version, but the NKJV title is now used universally. The NKJV translation project was conceived by Arthur Farstad. It was inaugurated in 1975 with two meetings (Nashville and Chicago) of 130 biblical scholars, pastors, and theologians. The men who were invited prepared the guidelines for the NKJV. The aim of its translators was to update the vocabulary and grammar of the King James Version, while preserving the classic style and literary beauty of the original 1611 KJV. The 130 translators believed in unyielding faithfulness to the original Greek, Aramaic, and Hebrew texts including the Dead Sea Scrolls. Also agreed upon for most New King James Bibles were easier event descriptions, a history of each book, and added dictionary and updated concordance. According to the preface of the NKJV, the NKJV uses the 1967/1977 Stuttgart edition of the Biblia Hebraica for the Old Testament, with frequent comparisons made to the Ben Hayyim edition of the Mikraot Gedolot published by Bomberg in 1524–25, which was used for the King James Version. Both the Old Testament text of the NKJV and that of the KJV come from the ben Chayyim text (known as the Masoretic Text). However, the 1967/1977 Stuttgart edition of the Biblia Hebraica used by the NKJV uses an earlier manuscript (the Leningrad Manuscript B19a) than that of the KJV. 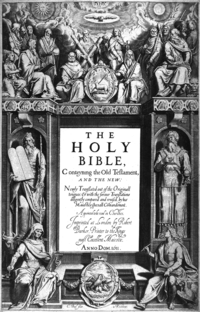 The translators have sought to follow the principles of translation used in the original King James Version, which the NKJV revisers call "complete equivalence" in contrast to "dynamic equivalence" used by many contemporary translations. The task of updating the English of the KJV involved significant changes in word order, grammar, vocabulary, and spelling. One of the most significant features of the NKJV was its replacement of early modern second person pronouns, e.g. "thou" and "thine", and corresponding verb forms, e.g. "speakest", with their twentieth-century equivalents. The Executive Editor of the NKJV, Arthur L. Farstad, addressed textual concerns in a book explaining the NKJV translation philosophy. While defending the Majority Text (also called the Byzantine text-type), and claiming that the Textus Receptus is inferior to the Majority Text, he noted (p. 114) that the NKJV references significant discrepancies among text types in its marginal notes: "None of the three [textual] traditions on every page of the New Testament ... is labeled 'best' or 'most reliable.' The reader is permitted to make up his or her own mind about the correct reading." The NKJV translation has become one of the best-selling Bibles. As of July 2012 it is listed as the third best selling Bible after the NIV and KJV by the CBA (Christian Booksellers Association). An unabridged audiobook version called "The Word of Promise Audio Bible" has been produced by the publisher. It is narrated by well-known celebrities and fully dramatized with music and sound effects. Gideons International, an organization that places Bibles in hotels and hospitals, at one stage used the NKJV translation along with the KJV, offering the KJV as the default translation and offering the NKJV when an organization asked for a Bible in newer English to be used. As of 2013, however, the Gideons have chosen to start using the English Standard Version (ESV) instead of the NKJV. ↑ The Holy Bible, New King James Version. Nashville: Nelson. 1982. ISBN 978-0840700537. ↑ "New King James Version (NKJV Bible)". The Bible Gateway. Retrieved 2011-09-14. 1 2 Arthur L. Farstad, "The New King James Version in the Great Tradition," 2nd edition, 1989, Thomas Nelson Publishers, ISBN 0-8407-3148-5. ↑ "CBA Best Sellers: Bible Translations". Christian Booksellers Association. July 2012. Archived from the original (PDF) on 14 July 2012. ↑ Cloud, David W. (2000-06-04). "Follow-up to Gideons and Modern Versions". Way of Life Literature. Archived from the original on December 11, 2001. Retrieved 2013-10-14. ↑ Staff (June 2013). "Development and Growth of the English Standard Version". The Gideons International. Retrieved 2013-10-14.